From his beginning as a butcher, Russell has toured the world performing comedy, hosted his own television shows, been part of a ratings winning breakfast radio team, competed as a celebrity contestant on a range of reality programs, headlined with Seinfeld’s Jason Alexander, and dabbled as a food critic for radio. Russell has written and performed in the Comedy Company for Network 10, received a Logie nomination for Best Comedy performer, was an essential part of the Hey Hey It’s Saturday team, starred in his own Russell Gilbert Show on the Nine Network, hosted the national radio broadcast Russell Gilbert Live, toured in the U.S. with Russell Crowe and his band, became a regular on Triple M’s the Cage, co-hosted with Livinia Nixon on the Nine Network series Bark Off. He has appeared as a celebrity guest on programs including Joker Poker andTemptation and proved he could hold a tune on the Seven Network’s, It Takes Two’ with Wendy Matthews and Network Nine’s Celebrity Singing Bee for charity. He also hosted the special ‘Great Comedy Classics’ for the Seven Network. Russell’s highlight for 2008 was touring around the country on a sell-out tour performing alongside Jason Alexander (aka Seinfeld’s George Costanza). Russell is a self-confessed “foodie” presenting guest cooking segments on television and as a fill in for “Honey Galore” on radio 3AW breakfast show with Ross and John – as well as a themed show “Chewing the Fat” on weekends with Dennis Walter. From a very early age Russell has been fanatical about two things – footy and comedy. When he wasn’t playing junior football or barracking for his beloved Footscray (now the Western Bulldogs), he was listening to his collection of comedy records. It was not until his early twenties that he performed his first stand-up routine… a popular win at a talent quest at the local football club. He went on to perform stand up at the Last Laugh Theatre Restaurant in Collingwood – an opportunity that proved to be a defining moment and lead Russell onto the main stage to work with comedians including Trevor Marmalade, Glenn Robbins, Mark Mitchell and Wendy Harmer. He has since carved out a consistent and successful career as a writer, performer and media presenter. 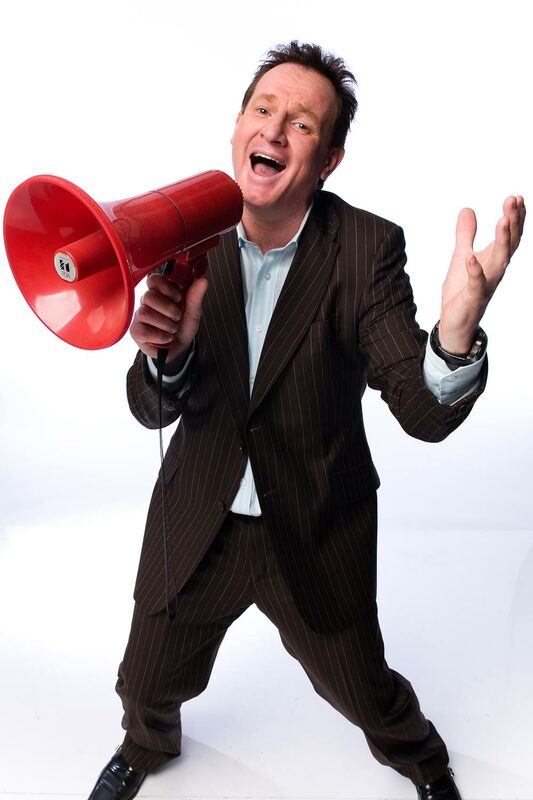 Russell has appeared in Trevor Marmalade’s Statesman of Comedy on the Comedy Channel, and featured as a regular in the 2010 series of the Nine Network’s Hey Hey It’s Saturday. Russell is a popular corporate MC, and is regularly booked for functions as far as New Zealand. He continues to travel Australia with his comedy shows and as celebrity MC of the ever popular Sexpo exhibition.